It’s Oscar’s first day of school and he’s a bit nervous about making new friends. There’s one child who seems particularly mean and scary - he pushes in at the dress-up box to grab the dragon costume and then later destroys Oscar’s sandcastle! Oscar tries very hard to be brave, but he retreats into the cubby to hide from the scary boy dressed as a dragon. 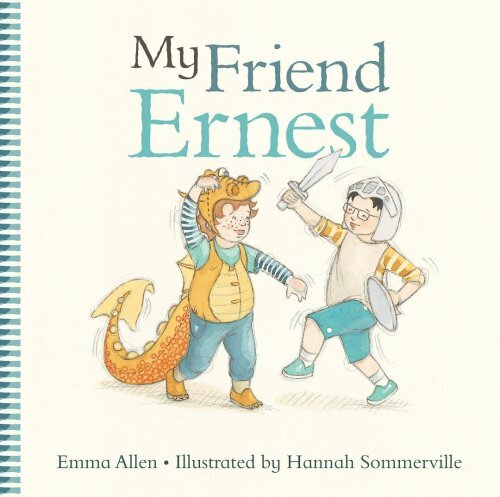 It is in the cubby that Oscar discovers the scary dragon is not so mean after all; but a nice boy called Ernest, who just wants to be friends. My Friend Ernest is an ideal book to share for the first day of school. All children will be able to relate to the playground conflicts depicted in the story and the anxiety around making new friends. This book can serve as a good springboard for discussion around the different ways other children may show they want to play; it can sometimes appear a bit mean, but maybe they just don’t know how to join in nicely? My Friend Ernest is written in the first person and the subjective pronoun ‘I’ is used frequently, making it a good choice for children who are working on this goal. For further speech and language targets in My Friend Ernest, see the list below.